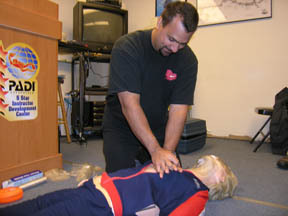 Because several PADI courses require students to have CPR/First Aid training, becoming an Emergency First Responder Instructor allows you to offer all-inclusive programs. Students will not have to look elsewhere for the training they need. The Emergency First Response Instructor Course provides qualified individuals with the additional training necessary to teach the Emergency First Response Primary Care (CPR), Emergency First Response Secondary Care (First Aid) and the Emergency First Response Care for Children courses. This course builds on the instructor candidates skills as primary and secondary care providers and focuses on developing their instructional abilities. 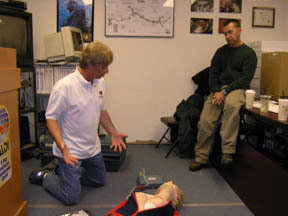 Through independent study, classroom sessions and practice teaching assignments, instructor candidates learn to conduct the Emergency First Response program. When an EFR Instructor has not conducted an EFR Course for a period of two years from their last renewal or have not submitted their EFR renewal application, they must re-qualify by means of the EFR Instructor Retraining Program. The EFR Instructor Retraining Program is a refresher course that includes practice on all skills, both Primary Care & Secondary Care, and over viewing and practicing any new changes and materials that have been implemented since the instructor was last renewed. This course is typically a half-day program, however, it may be longer based on candidates level of comfort with skills practice, and the volume of changes/new materials to cover. Individuals who are current CPR/First Aid Instructors with another qualifying organization may earn the Emergency First Response Instructor rating by completing an entire EFR Instructor program or by attending an EFR Instructor Crossover program. The program covers information about the EFR program philosophy and marketing. There will also be an Instruction Workshop, where all skills will be reviewed. This will be followed by a written exam.